The last time Italian journalist Emiliano Fittipaldi wrote an exposé about corruption at the heart of the Roman Catholic Church, it landed him in a Vatican court facing a possible jail sentence on charges that he had illegally obtained confidential church papers in the course of his reporting. Now, six months after the 42-year-old reporter was cleared of all charges, Fittipaldi is taking on the church again. This time in a new book that accuses Pope Francis of doing “close to nothing” to stop clerical sexual abuse in Italy and around the world, despite the Argentinean pope’s frequent assertions that he has zero tolerance for the abuse of children or those who protect abusers. Continued. He's right again. Francis' appalling record on protecting perverse clergy speaks for itself. 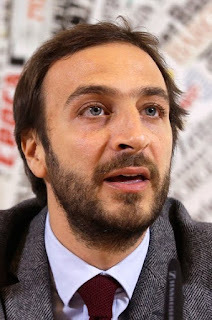 Previously Fittipaldi was one of those who used received documents to expose financial misdoings by various parties inside the Vatican, thereby helping the Pope, and indirectly Pell (in his present job). Most Catholics don't realise Popes get their arms twisted and no Pope would be allowed power over abuse discipline cases anyway. Hence there is no shortage of people that find it easy to "make Francis look bad" on this as on myriad other things. Either being asked to spin this line was the quid pro quo for his being let off the criminal case (which, in its own terms, was the right verdict in my opinion incidentally), or he was inclined to do so anyway, by way of continuing his survey of things about Vatican affairs to take a dim view of - and being not personally motivated to take a realistic line about the Pope's powers (from his vacuous stare he doesn't look to be a deep man). Add this to all the other stunts that are continually being pulled around Francis - I get a strong feeling the ground is being prepared for a "compromise candidate". That it is no doubt very much about Pell is less worrying than that it is being made to look to be about Francis. With a number of other prominent bishops sinking the Australian Church anyway, they begged Francis to at least take Pell (at least on account of his obviously not dealing with Mulkearns' delinquency) off their hands to make it less obvious. Apparently he is quite good at this present job of his, all the more reason for the culprits on the money side to want to get back at Francis who is continually breathing down their necks. the article mentions "the culture of the church" in certain countries and how there's a strong tendency to keep things hush-hush. well, the work on guam ain't over. if anything, it's only beginning: silent no more! It's no wonder why Arch. Apuron proudly selected his words "They can't touch me". Gupot Guam? Pucked, open all DOC gates and set the prisoners FREE?